Is this the reader you’re writing for? 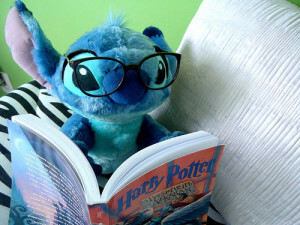 Because Stitch is adorable but his tastes might be a little alien. Crap is relative. One man’s flower constructed of perfectly-selected words in lyrical proportions is another man’s unnecessary navel fluff. One woman’s riveting background full of juicy details is another woman’s journey down a random tangent full of annoying barbs that get stuck in her hair. What does this mean? It means you can’t please everyone (just like with everything else in life), so don’t try. Trying to please everyone is simply setting out to fail. So what do you do? How do you know if you’re writing the right stuff? Write for one person. Make it the best that you can for that single person; make it their literary diamond. Chances are, the one person you should write for is you. Writing what you want to read is a great place to start. You might be the only reader you ever write for. But considering all the different types of things that you like, is that a problem? No, not at all. It’s a focus. It’s a way to know that your story is the right one for the right audience. What if you’re writing for an audience that you can’t represent (for example, children)? Then pick someone who represents the type of reader you want to aim your story at. Understand that person. Know what they love and what they hate. Know how they read and what and why, and all of those juicy things that will help you craft a wonderful nugget for them to love. Write for that single, solitary reader. Speak directly to them through the words you wrangle. Make your story a conversation they can get engaged in. And the rest? They’ll like it or they won’t, and that’s okay. The right people will like it: that’s what’s important.